Service charge, user charge and convenience fee paid by gateways and vendors on online or card payments will be waived once steps approved by the Cabinet on Wednesday come into effect. Also, above a threshold, one has to make payment online or through cards. The move would discourage cash payment and help tax authorities get leads on evasion. The Cabinet approved various steps in this regard to be taken in a year to two years to boost these payments. Service charge is currently levied by payment gateways and paid to the government. The vendor using a payment gateway also pays a convenience charge. On credit cards, it is 1-2.5 per cent. The move will help the government in carrying out its financial inclusion programmes digitally. “It will help reduce transaction cost and encourage electronic mode of payment, facilitating the financial inclusion agenda of the government,” said Kalpesh Mehta, partner, Deloitte Haskins & Sells. The official statement explained the promotion of payments through cards and digital means will be instrumental in reducing tax avoidance, migration of government payments and collections to a cashless mode. To give a perspective, 569 million transactions were made till December of the current financial year, with payments worth Rs 67.75 lakh crore. The largest e-commerce site, Indian Railway Catering and Tourism Corporation, earned Rs 1,100 crore in 2014-15, of which Rs 350 crore was from e-ticketing. A daily 550,000 tickets were booked on the site. Other steps approved by the Cabinet include rationalisation of telecom service charges for digital financial transactions and promotion of mobile banking. The move primarily discourages transactions in cash by providing access to financial payment services through cards and digital means, went the statement. Creation of assurance mechanisms for quick resolution of fraudulent transactions and reviewing the payments system in the country have also been approved. The infrastructure of card and digital payments is growing but remains modest in comparison to cash payments. For card and digital payments to increase, these should be easy to use, readily available and accepted, should not impose any undue financial burden on the merchant and user, and should offer an appropriate level of security. The evidence indicates penetration and success of card and digital payment products and services is concentrated to a large extent in tier-l and tier-ll locations, mostly to citizens with access to the formal banking channels. Introduction of the Payment and Settlement Systems Act, 2007,s resulted in deeper acceptance and penetration of modern card and digital payment systems. An Aadhaar Enabled Payment Systems has been brought to leverage upon biometric verification and a domestic card network, RuPay. The Reserve Bank of India recently approved licences for setting up of payments banks, with the objective of greater financial inclusion to migrant labour, low income households, small businesses and other unorganised sector entities. This would help card and online payment to spread among the poorer strata. CHENNAI: India with more than 380 million internet users has emerged as the third-largest internet user. And nearly 60% of this user base make purchases online – a user base, whose credit history and risk profile is still unknown. And credit rating agency CIBIL hopes to step into that gap and maintain credit scores for users of e-commerce websites just as it is currently doing for clients of India’s banks, car dealers and non-banking financial institutions. CIBIL said on Wednesday that it is in talks with the Reserve Bank of India (RBI) for bringing e-commerce customers of online payment processors like PayPal, PayTM and Citrus Pay in the loop. The rating agency, which has been collecting and maintaining records on individual’s payments on credit cards and home, car, corporate, agricultural loans, etc, plans to now profile online customers as e-commerce picks up pace in India. Simply put, if CIBIL succeeds, then Amazon, Flipkart, Ebay and others will know the credit profile of their buyers and can plan their strategy for payment on an instalment basis and payment by cash. CIBIL currently puts out reports based on the inputs it received from member banks and credit institutions on a monthly basis. The decision to extend its reach to e-commerce sites will bring with it challenges in terms of confidentiality of information and setting up a network with the current players in the online payment space, said Satish Pillai, CEO and MD of CIBIL. “Thanks to the way we keep a tab on a person’s spending habits and credit history, payments and loan sanctions have become a lot faster. If you are sitting at a car dealer and waiting for the EMI amount to get clearance – real-time clearance will happen if your credit score happens to be good. So CIBIL’s credit scores make for faster risk assessment and less due diligence from the credit giver – making for faster sanctioning on loans. We are now hoping that to add additional layers of information to our existing database,” said M V Nair, chairman, CIBIL. CIBIL also said that it is in talks with the regulator for extending this facility for customers of utility companies and telecom providers. “We are seeing a real need in this area. Say your postpaid bill with a mobile service provider has a credit limit of Rs 500 – if CIBIL scores come into play in that arena – and say your credit history is good – then it could be instantly raised to Rs 2,000 without any need for a check from the service provider. CIBIL scores would make for seamless transaction with greater ease and smoothness,” said CIBIL’s Pillai. “The current system of sending a person to come and verify the address, customer profile and authenticity of documents will get outdated. It costs time, labour and money. With CIBIL, the utility or telecom provider would have all the information that they would need a click away,” he added. Each time Anamika Singh shops online, it takes her 15 minutes to complete a transaction. A wedding and lifestyle photographer, she enters a debit card grid password, apart from a one-time password (OTP). If connectivity is slow, she starts the payment process all over again. During her latest online purchase, she found a new payment option whereby she could make the payment via an e-wallet. She plans to soon use it. Pawan Saxena, her husband, however, remains wary of doing any online transactions, for fear of fraud. Leading banks now provide technology-driven payment and money transfer solutions through social media platforms, e-mails, text messages or even by no more than a tap on a smartphone. 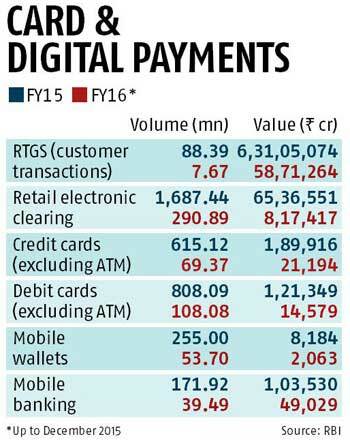 Non-banking entities like e-commerce companies are offering electronic wallets. “Banking these days is no longer about opening accounts or increasing card usage. Every player wants its customers to transact more and provides them all possible ways of transactions using digital modes,” says Mudit Bhatnagar, marketing head at ItzCash Card, an Essel Group company offering prepaid card solutions. E-wallets may be issued by banks, big e-tailers, third-party independent payment companies like Paytm or Citrus Payment Solutions, and by mobile operators. It is an online prepaid instrument, whereby you load money into this through your bank account, debit card or credit card. Typically, three types of transactions are done – shop and pay online, pay online and use it offline or shop and use offline. “Our target is to offer digital payments for all three kinds of transactions,” says Kumar Aditya, vice-president at Paytm. In semi-closed wallets, the maximum reloadable amount and the maximum balance every month is Rs 10,000. This can go up to Rs 50,000 or Rs 1 lakh in the wallet if you supply Know Your Customer (KYC) documents to the issuer. A major attraction of these are cashback offers, discounts and deals. You spend Rs 500 and get a refund of Rs 70. You save money even as you spend. With almost 60 entities getting registered to provide online wallet services (according to the Reserve Bank of India’s website, as on October 28), choosing a prepaid wallet is a challenge in itself. Depending on the issuer, the wallet will have different features. For instance, one issued by an e-tailer might allow you to buy only its products, a closed wallet. So, you should load only that amount for which you are likely to shop at that retailer’s website. A semi-closed wallet, like Ola Money, will allow you to buy products or services with only its tie-up partners. Independent e-wallet providers like PayUmoney offer guaranteed savings of one per cent (as in you pay one per cent less than the purchase price). So, if you shop for Rs 30,000 through the PayUmoney wallet, you will certainly pay Rs 300 less, beside any other discount that might be offered by the merchandiser. “While the entire online industry is focused on getting online shoppers to spend more, on the promise of the highest ‘discounts’, PayUmoney thrives on savings,” says Virender Gupta, head of PayUmoney Wallet. Bank-sponsored wallets have now started offering as many cash-back offers as third-party wallet issuers. They’ve also loaded a few banking features to their offerings. ICICI Bank’s Pockets wallet enables electronic payments through a smartphone at physical stores as well. “It’s a digital bank on your mobile phone. It combines e-commerce payments to any website or app in the country, people-to-people payments, gifting and offers,” says Abonty Banerjee, general manager and head, digital channels at the bank. Axis Bank’s’ GetonLime wallet has options like pool money for a group expenditure, a shared wallet so that family members can use the same one. With HDFC Bank’s PayZapp application, instead of loading an e-wallet, customers can link any of their debit or credit cards to it. “PayZapp’s prepaid card can be used in any Visa/MasterCard merchant and is not limited to the select services the wallet provider offers. This exponentially opens up usage points for the customer as against any third-party service provider” says Parag Rao, the lender’s business head for card payment products. While e-wallets allow you to transfer money to other bank accounts and other wallets, leading banks are also offering payment solutions through every digital medium. For instance, State Bank of India has announced a plan to add ‘Batua’, a mobile wallet, to its existing mobile app, SBI Buddy. Kotak Bank’s KayPay allows you to transfer money to friends without asking for their bank account details. You don’t have to be their customer and neither does the transferee need to have a Kotak account. You have to pick up names from your Facebook friends’ list, e-mail ID or their mobile number, authorise the amount to be paid and complete the transaction using an OTP. The bank says it has enrolled around 10,000 customers for the service. ICICI Bank’s Pockets wallet also allows customers to transfer money through e-mail, Facebook or by mobile, using near-field communication to another smartphone in the vicinity. iMobile, its mobile banking app, allows cash withdrawals at an ATM without actually using a debit card. Its mVisa facility allows customers to scan a mVisa Quick Response code at a merchant location without swiping the card at the machine. Most features offered by banks are targeted at youngsters, too. There are options like share or split bills, instant money transfer or sharing wallet accounts and payment of college fees. Both ICICI Bank and Kotak Bank allow banking through social network site Twitter as well. “Our whole payment experience is built in a way that one doesn’t necessarily need an e-wallet for a frictionless transaction experience” says Deepak Sharma, head of digital initiatives at Kotak. Competition among banks will only make things better for consumers. Apart from technologies like a sound-based payment system, HDFC Bank plans to launch MasterPass, a type of e-wallet that will store all your Mastercard details and while shopping, you can choose which card you want to pay with. ATM :: Are e-wallets beginning to worry banks? New Delhi: In the last week of October, Paytm founder Vijay Shekhar Sharma received a message from State Bank of India (SBI). It wasn’t good news. The message said the nation’s largest lender and its associate banks would no longer allow their customers to load money from their accounts onto the Paytm wallet. “The reason that was given to us when we wrote back was that the net banking service was for shopping, not for uploading wallets,” said Sharma. Paytm, run by One97 Communications Ltd, claims to have 100 million wallet users, who carry out more than 60 million transactions per month. Investors in the company include the Alibaba Group and its affiliate Ant Financial Services, SAIF Partners, Sapphire Venture and Silicon Valley Bank. SBI’s affiliates include State Bank of Bikaner and Jaipur, State Bank of Hyderabad, State Bank of Mysore, State Bank of Patiala and State Bank of Travancore. SBI did not respond to emails, text messages and phone calls seeking comment. Users of the Oxigen wallet aren’t allowed by the payment gateways of SBI and Citibank NA to load their wallets, said Ankur Saxena, chief executive of Oxigen Wallet, offered by Oxigen Services India Pvt. Ltd. Occasionally, they encounter problems in loading money using SBI Maestro cards, too, he added. From time to time, ICICI Bank Ltd’s net banking service prevents Oxigen’s wallets from being loaded on suspicion of fraud and does so after being reassured by Oxigen that the transaction is genuine, Saxena said. “As a responsible bank, we take various risk-mitigating measures to protect interests of our customers, largely in consultation with wallet owners. These may include temporarily stopping funding to certain wallets in extreme cases to prevent fraudulent transfer of funds through these wallets,” ICICI Bank said in an emailed response. Are banks, which have launched their own wallets, getting worried about the rise of independent wallet companies facilitating online payments and cash transfers? SBI has its own wallet service, called Buddy. ICICI Bank (Pocket) and HDFC Bank Ltd (PayZapp) too have their own wallets. Technology-savvy mobile wallet companies have enabled smartphone users to access their current and savings bank accounts (called CASA in banking lingo) for online payments and money transfers, according to Bindu Ananth, chair, IFMR Trust. She was speaking at a Mint Cash to Digital summit on 6 November. Electronic wallets are becoming increasingly popular in India, riding on the back of the growth of e-commerce (most Indians are still chary of using plastic online, and wallets are definitely more convenient than paying cash on delivery). There is no estimate available on the number of transactions that happen through such wallets every day and the value. A report by RNCOS, a research firm, estimates that the business of wallets itself (not the business done through wallets) at Rs.350 crore currently. That is expected to more than triple to Rs.1,210 crore in 2019, the researcher said. So-called third-party wallets (those not offered by banks or credit card companies) do better, says an expert. “Globally, independent third-party mobile wallets have done better compared with wallets offered by banks because for the former, that is a focus business area,” said Ravi Trivedy, a consultant and former partner with consulting firm KPMG. Interestingly, soon after independent wallet companies started operations in India and gained prominence, many banks launched their own wallets. In fact, SBI even plans to launch a wallet for feature phone users by next month called Batua, as reported by The Economic Times on 12 November. Trivedy says wallets could redefine banking and payments the way automated teller machines (ATMs) did. “Before anyone realized, the early movers (in ATMs) became too big,” he said. Still, he is not convinced that banks are trying to stifle the growth of wallets “by design”, although he admits that it is only natural that banks be reluctant to allow their digital infrastructure to be used. Indeed, Satyen Kothari, co-founder, Citrus Pay, and Bipin Preet Singh, co-founder and chief executive officer, MobiKwik Systems Pvt. Ltd, say that their wallet services have not faced any problems of banks preventing cash uploads. Banks would rather want to have their own wallets or form partnerships with payments bank, said Ashvin Parekh, managing partner, Ashvin Parekh Advisory Services Llp. “They would want to partner payments bank rather than anyone else as there is revenue sharing,” he added. SBI has partnered Reliance Industries Ltd, which has got a payments bank licence. Interestingly, Sharma of Paytm, in his individual capacity, has also been awarded a payments bank licence by the Reserve Bank of India. If banks do not want these third-party wallets to leverage their infrastructure, rather than not allowing them to use their channel, they may discourage the usage through other means—such as levying a charge, said Parekh. On Friday, joining the ever-growing list of third-party wallet providers, cab-hailing service Ola announced that it is entering the mobile payments space with the launch of its dedicated mobile app called Ola Money, a move that will put Ola in direct competition with Alipay-backed Paytm and Snapdeal-owned Freecharge, as reported by Mint (http://bit.ly/1SMPfLs).